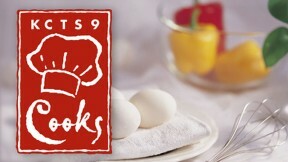 "KCTS 9 Cooks" is a home cooking show that is produced twice a year with the best cooks we know - our viewers! Hosts George Ray and Carol Dearth join our guest cooks, to prepare their specialties. Every new "Cooks" episode comes with a companion cookbook, usually with 300+ recipes, featuring appetizers, main entrées, desserts, and everything in between.